What is in the Retirement Accounts of Millionaire and UHNW Investors? Roughly two-thirds of Millionaires and 55 percent of Ultra High Net Worth investors have an employer-sponsored defined contribution plan such as a 401(k), our research finds. What is the breakdown of these retirement accounts? Asset Allocation, Portfolios and Primary Providers, our most recent wealth level study of Millionaire investors with a net worth up to $5 million (not including primary residence) finds that nearly 40 percent of their retirement accounts is comprised of equities, while 19 percent is comprised of fixed income investments. Analysis across age groups finds that equities comprise roughly 40 percent of retirement accounts of Millionaire Gen Xers (39 percent), those ages 45-54 (37 percent), Baby Boomers (39 percent) and seniors 65 and up (40 percent). Across all age groups, retirement account investment in fixed income is consistent between Gen Xers (19 percent), those ages 45-54 and Baby Boomers (18 percent each) and seniors (21 percent). Investment in short-term investments decreases with age, from 16 percent of the retirement accounts of Gen Xers to 9 percent of seniors. An analysis of retirement account breakdown by net worth finds that investment in equities increases among wealthier Millionaires. Forty-three percent of the retirement accounts of respondents with a net worth between $3 million and $4.9 million are comprised of equities, compared with 37 percent of those with a net worth between $1 million and $1.9 million. When we look at the breakdown of retirement accounts by occupation, we find that senior corporate executives have the highest percentage invested in fixed income investments (25 percent) and equities (46 percent). 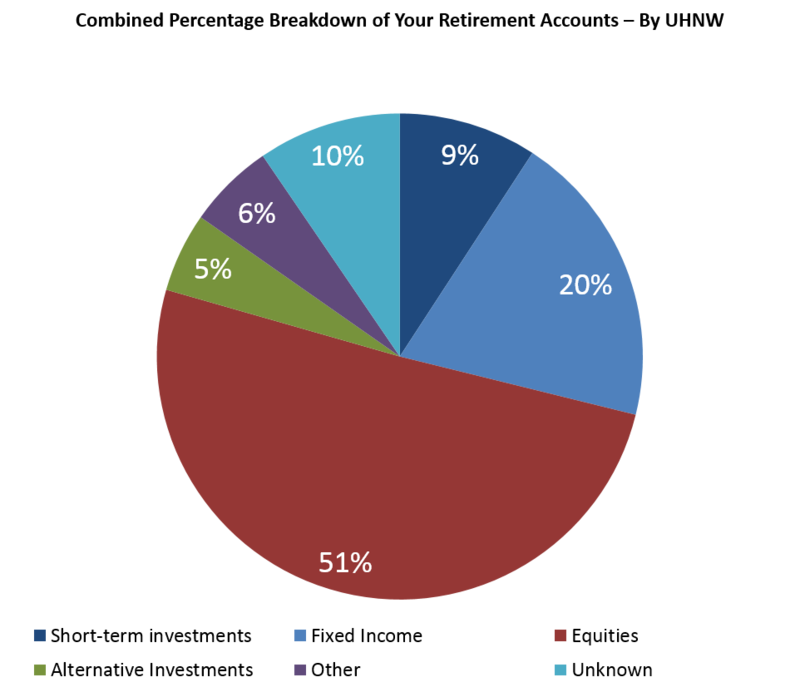 When we analyze the retirement accounts of UHNW investors by occupation, we find that the highest percentage of equity investment (61 percent) is found in the retirement accounts of business owners, while senior corporate executives and professionals are most likely to have the highest percentage of fixed income investment (roughly 24 percent) in their retirement accounts.